Watch this video by James Grime from the Numberphile YouTube channel, which is all about the number 357,686,312,646,216,567,629,137. Watch carefully and then answer the questions below. 1.1. James showed you a truncatable prime, whereby the left digits can be removed one by one to create a set of smaller, but still prime, numbers. Which of these is a left-truncatable prime? 981 is wrong, because it leads to 81 (9 x 9). 983 looks okay, because 83 seems prime, and 3 is prime. 985 is not prime, because it ends in 5. 987 is a multiple of 3, because (9 + 8 + 7 = 24), and 24 is a multiple of 3. 989 is not prime, because it is clearly divisible by 3. So the answer must be 983. 1.2. Which of these numbers is NOT a left truncatable prime? 651 leads to 51 (3 x 17). 1.3. Which of these numbers is NOT a left truncatable prime? What odd number is not a prime? This is a tricky one. The answer is 971. Although 971 is prime, and 71 is prime, the number 1 is NOT prime. Some people argue about whether or not 1 is prime, but there are good reasons why mathematicians agree to define 1 as NOT prime. 1.4. James showed you the largest left-trunctable prime number, which has 24 digits. How many digits are in the largest known prime number? You might have to google this. As of January 2019, the largest known prime was [ 282589933–1 ], a number with 24,862,048 digits. 1.5. So far, we have been discussing LEFT-truncatable primes, but what about RIGHT-truncatable primes, numbers that remain prime as you successively remove the right-most digit? Which of these numbers is NOT a right-truncatable prime? 743 is not a right-truncatable prime, because it leads to 74, which is even and therefore not prime. 1.6. Which numbers are more common? Left-truncatable primes are more common, and right-truncatable primes less common, because the right-most digit is very important in determining whether or not a number is prime. All primes above 5 end with the digit 1, 3, 7 or 9, so a right-truncatable prime can only contain those digits after the digit on the extreme right. The largest right-truncatable prime is the 8-digit 73,939,133, compared to the largest left-truncatable prime, which is the 24-digit 357,686,312,646,216,567,629,137. Before 1971, Britain had pounds, shillings and pennies (rather than pounds and pence). There were 20 shillings in a pound, and 12 pennies in a shilling, which means 240 pennies in a pound. 2.1. If you bought a magazine costing 1 shilling and 6 pennies, how much change would you get from a £1 note? £1 = 20 shillings, so the change would be 19 shillings, if the magazine cost 1 shilling, but it costs an additional 6 pennies. 1 shilling = 12 pennies, so the answer is 18 shillings and 6 pennies. 2.2. 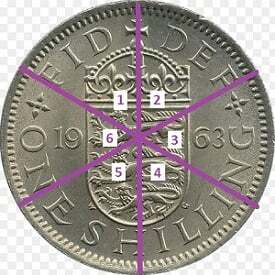 This image shows the back of a one shilling coin, and you can see that it is dated 1963 across the middle. However, why might someone mistakenly think the coin was minted in 1771. Which sector of the coin might give this false impression? Sector 4 contains the letters ILLI of the word SHILLING, but if you rotate the coin by 180 degrees you could read ILLI as 1771. Some of you may have seen this mathematical amusement from a previous year of the Parallel Project, but please look at it again, because this time you will need to think about it a bit more deeply. Grab a pencil, paper and ruler. The second quadrilateral is a parallelogram. But why is it true? 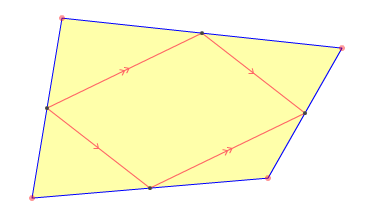 How can you prove that the second quadrilateral is always a parallelogram? On the same page as the interactive graphic, if you scroll down you will find a short proof. A mathematical proof is an extraordinary thing. A thing of beauty. Some are just a few lines, while others run for a hundred pages or more. Each proof is a step-by-step argument that shows why something is true or false with absolute 100% confidence. Once something is proven, then the proof remains solid for eternity. This particular proof is very short, but not simple to follow. Have a go at understanding the proof (remember to scroll down to find it), but don’t worry if it does not make complete sense.